Clyde Mews has been shortlisted for the category “Residential Architecture - Multiple Housing”. Congratulations to our architects Six Degrees! From pristine white yoga studios, coworking spaces in warehouses and a tired university bookshop transformation - projects nominated for the Australian Interior Design Awards 2019 are set to face tough competition. One look at the shortlisted entries could tell you that Victoria is leading the country’s interior design scene with 119 nominations, followed by NSW’s 63 and Queensland’s 13. 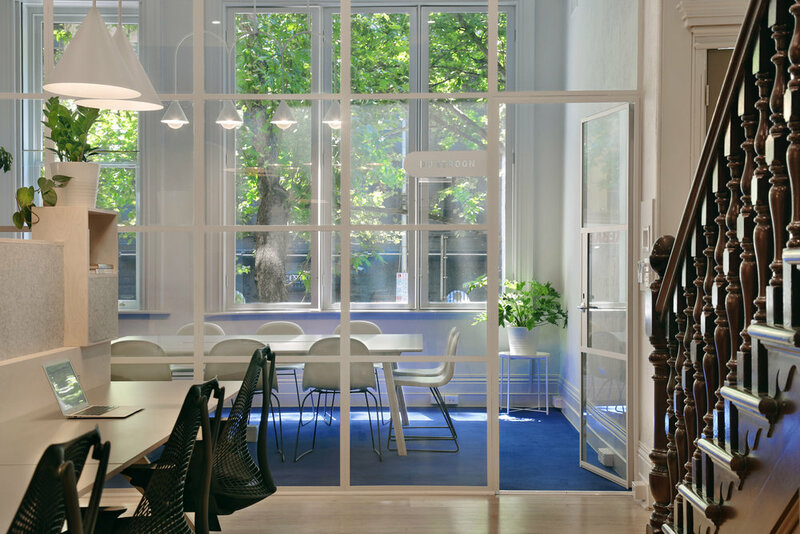 In workplace design, Victoria dominates the section with 20 nominations, followed by NSW with 13. 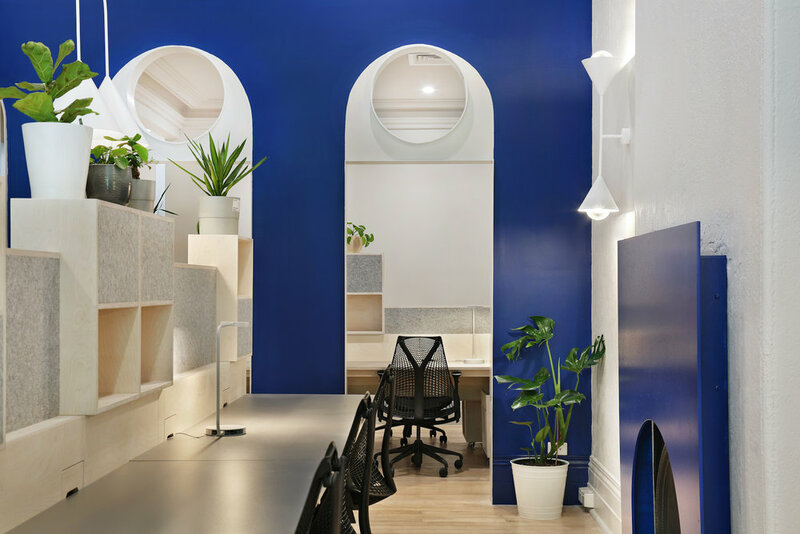 Excelon has announced the opening of 25 King Collective, a shared office space in Melbourne’s CBD. Kelvin Taing, Director of Excelon says the Excelon team has moved into the top floor in the premises in Melbourne’s South West CBD area. Work has begun to revitalise unsavoury parts of Melbourne CBD. Developer Excelon has renovated a historic 3-storey building at the South West of town at 25 King St.
25 King Collective is part of a wave of new developments in the area. Melbourne recently became home to Clyde Mews, an inspiring “eco-village” that champions sustainable, community-focused living in close proximity to the city center. Created as an alternative to resource-intensive, car-centric developments, Clyde Mews features attractive, pedestrian-friendly design and energy-efficient housing. Designed by local architecture firm Six Degrees Architects for property development company Excelon Group, the eco-friendly development includes eight contemporary townhouses fitted out with sustainable elements — such as solar panels and water-efficient appliances — inside and out. King Street, the infamous 2km strip which links Melbourne’s western side of the city to the north, has been undergoing a major revitalisation of late. You wouldn’t know it yet, but once all plans come together, this much maligned and extensively profiled (not in a good way) part of the city could become not only a vital business hub, but also a thriving arts precinct. Brother-and sister-developers Kelvin and Rachel Taing will turn a rundown King Street building into their business headquarters and a boutique flexible workspace as they join the rejuvenation of Melbourne’s once-seedy west end. The official shortlist for Architecture & Design’s 2018 Sustainability Awards has been revealed. The prestigious awards are the longest running sustainable building awards in Australia and have been showcasing the brilliant work of Australian designers and architects working towards a more sustainable agenda. Architecture & Design sees the importance of this growing sector and an ever-increasing need to innovate for a more efficient and ecologically friendly built environment. Excelon Group's Lothian Street development has been designed by Kennedy Nolan to reference the area’s industrial past, with a warehouse style brick façade employed. Located at 100 Lothian Street, North Melbourne the development comprises six individually designed townhouses and two apartments crafted in collaboration with some of Melbourne’s top local artisans, including family-owned local Victorian brick manufacturer Krause Bricks. There is a growing body of anecdotal evidence that people are increasingly prepared to fork out more dollars for sustainable homes and that sustainable homes do better on the market. The shift is driven partly by soaring energy prices, greater environmental awareness in key demographics, and the transition to an owner-occupier property market as investors fade away, industry observers say. One developer in Mebourne’s inner north, Excelon Group’s Kelvin Taing, says his company just broke the residential price per square metre sales recordin the inner northern Melbourne suburb of Thornbury thanks to home-buyers attracted to sustainability and lifestyle-enhancing features that they are increasingly prepared to pay for them. A THORNBURY development has used environmentally-friendly features and a communal vegetable patch to reset the record books. The Clyde Mews development by brother/sister duo Kelvin and Rachal Taing has notched the suburb’s top one-bedroom apartment price at $560,000, according to CoreLogic records. The boutique development at 80 Clyde St, Thornbury has six townhouses in addition to its two one-bedroom apartments, and a communal garden at its heart. The townhouse trend is gathering pace with a new project in Melbourne’s inner north setting a record price for the suburb. Popular with downsizers or young families getting into the market for the first time, townhouses have been growing in popularity across demographics. In Melbourne’s trendy Thornbury, local developer Excelon Group is building the Clyde Mews with six townhouses and two apartments, designed by Six Degrees Architects. 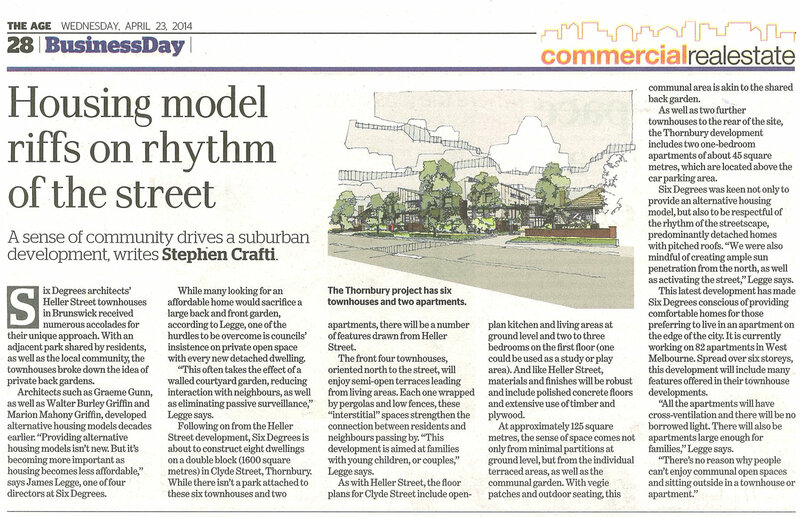 Prices have hit suburb records of $8500 a square metre for the townhouses and $10,000/sq m for the apartments. Yet another Brunswick apartment development has gone to 'the green side'. 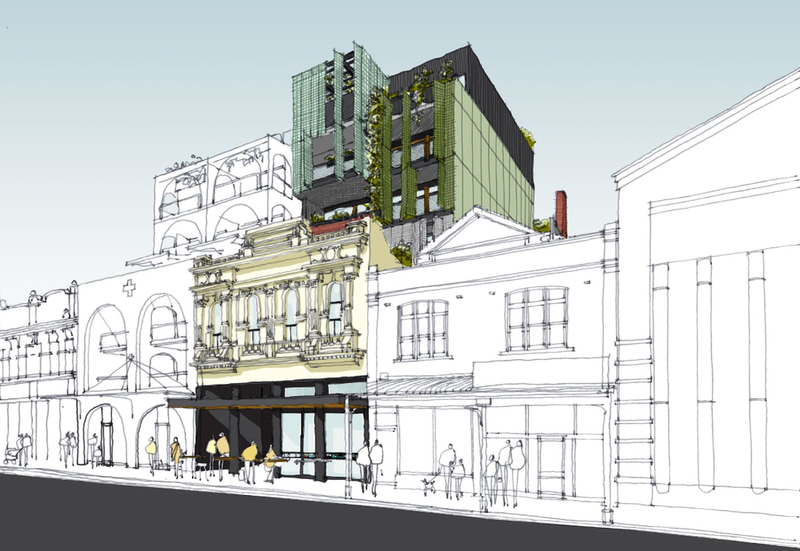 A proposal for 211-213 Sydney Road currently before Moreland City Council is hoping to convert approval onsite for a more typical planning permit to one that includes heightened environmentally sustainable design aspects. Design practice Six Degrees have taken over design duties for the site, replacing what was a failed design and marketing campaign for The Saxon apartments. Prior to it being offered for sale, The Saxon included 24 apartments within a Rothelowman-designed project. Eventually though the roughly 600 square metre site was put forward for developers to consider during 2017. The property sold in front of a large auction crowd Friday for $700,000 over reserve with bidding starting around $4.5 million. The vendor, Australian Institute of Radiography, purchased the rendered brick building, with four levels including the lower subterranean floor, for $3.5 million in 2010. It sold with vacant possession to Malaysian developer Kelvin Taing, whose family formerly controlled WCT Group which is listed on the Malaysian stock exchange. Six Degrees architects’ Heller Street townhouses in Brunswick received numerous accolades for their unique approach. With an adjacent park shared by residents, as well as the local community, the townhouses broke down the idea of private back gardens. Architects such as Graeme Gunn, as well as Walter Burley Griffin and Marion Mahony Griffin, developed alternative housing models decades earlier. “Providing alternative housing models isn’t new. But it’s becoming more important as housing becomes less affordable,” says James Legge, one of four directors at Six Degrees.